Cut into bars for breakfast on busy mornings. CrustIn a large mixing bowl, combine oats, brown sugar, sliced almonds, flour, baking soda, and cinnamon. Pour in melted butter or margarine and stir to combine. Press into two greased cake pans (or one 13 x 9 casserole dish). 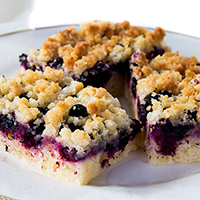 FillingIn the same bowl, toss blueberries with sugar, flour, and almond or vanilla extract. ToppingWipe out bowl and combine flour, brown sugar, and cinnamon. Cut in butter or margarine until crumbly. Sprinkle over the blueberries. Bake at 375°F for 25 to 35 minutes until set and golden brown on top.